Greetings Wargamers and Hobbyists, and welcome. Here we are again, and this time around I would like to talk about record keeping – ‘lists, lists and more lists of dead, wounded, and gazetted Sharpe’! I think it is fairly common these days for a gamer to keep track of their game results, whether for fun, for posterity, or because a player regularly frequents tournaments and therefore it is in their DNA. 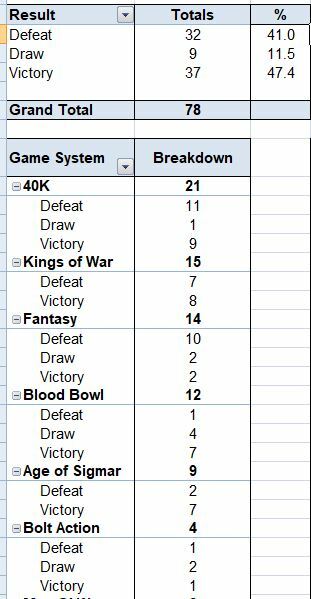 I myself keep a fairly detailed record of my game results, including tables showing my record with each army or faction I play, and each game system, which covers more or less every game I have played at my local club since joining in 2012. To be honest, I expect the level of detail that I record is probably more than most, but recently more and more I am asking myself why I bother to record results at all. So what cause could a gamer have to want to keep a record of their game results? Well I have found that people record their game results for various reasons. The obvious ones are people playing in tournaments or leagues, because the results of their games directly influence who they play next, and their overall standing in whatever event they are taking part in. Whether it’s an Age of Sigmar, Kings of War or Blood Bowl league, the impact of game results will be broadly similar. Gamers taking part in a campaign will also record the results of their games, which will again affect which battle they play next and against which army, but rather than for clinical advancement, it is for the furtherment of a narrative, and ultimately the determination of which faction has won their campaign by either destroying their enemies or achieving certain objectives. These are all understandable reasons for a person to record their game results – it is part of the process of managing the event they are taking part in. There is another group of gamers that record their game results that straddle most of the other groups, and those are the gamers that enjoy taking photos and making notes as they play, in order to later on recount their battles in the form of a battle report, whether in text and photos or as a video uploaded to the internet for us all to enjoy – including on this very website! 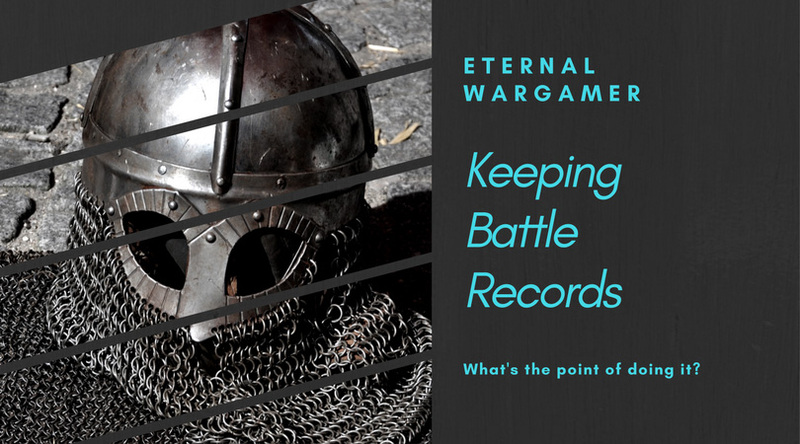 I have presented the odd match or battle report myself over the years, but that has mainly been a side effect of the record keeping rather than its driver. For me, keeping a record of the results of my games was a form of self-assurance, of self-validation. In other words, for some reason it had become important to me to know how well I was performing as a gamer in comparison to my peers. I think the reason that this became the case was that I have been in the hobby for what I think is a substantial amount of time; 24 years and counting, and way back in the early days, I was pretty successful within the group of young-to-mid teens that I played with, whether we were playing Warhammer Fantasy, 40K, Man O’ War or anything else. I just seemed to be either lucky, or perhaps have a slightly more developed understanding of the game rules and how they interacted. Whatever the reason, I did well. Fast forward several years, having stayed in the hobby, but playing only infrequently at home or at my FLGS, I found a local club and started playing there. Since then I have remained a club gamer, initially at that first club, and then at my current club. What I found at both these clubs was that I had gone from what could perhaps be described as a medium sized fish in a very small pond, to being a medium sized fish in a much larger pond, which was populated by lots of other medium sized fish. Some of those fish also focused almost exclusively on playing only one game system, and sometimes only one faction within that game system to the exclusion of all else, which meant that they were much more practiced in the current rules and strategies than I, as a player of varied games and armies, was likely to be. that I felt like I was struggling to keep pace. This was a knock, both to my confidence as a gamer, and to my desire to want to play games. Gaming had been such an integral part of who I was for such a long time, that to feel like it wasn’t my thing anymore was like standing on the edge of a precipice. The decision I made at the time was to start recording the results of my games, which wasn’t something I had really done in the past in anything more than a casual sense. I could show you exactly how many games I had played, which system, against who, with what armies, game size, mission or scenario, and my percentages for each area. It’s surprising how much info you can get out of one table of data when you work with spreadsheets and reporting systems as much as I do. I became very conscious of what the impact of losing or winning my next game would be, how it affected my overall ‘loss percentage’, how many games I needed to win to ‘break even’, and this also affected decisions about which armies to play, and how often I changed out my list. I took the advice of other gamers, like Skari of the SkaredCast YouTube channel, who advocated playing a set number of games with a list while making only very minor tweaks to the composition, and focusing hard on the scenario victory conditions to try to give me the edge in games. In 40K for example, I would deploy my army around being able to go for the ‘First Blood’ victory point on turn 1, so that my opponent would be on the back foot from early on. I also started to look at the combinations of units I was using, what equipment they had, and which tasks they were best suited to. In essence, what I had done was decide to try to be a better gamer, through careful consideration, maintenance of aim, and a refusal to panic. Slowly, very slowly and over many months of gaming, I dragged my results record up from being disconcertingly on the poor side, first to swinging from positive to negative, and eventually to being positive with a couple of games as a buffer before drawing even again. It felt like the ship had been steadied. Playing games like Blood Bowl, which I still seemed to do rather well at, helped with the results, as did building up fairly solid lists for both my Tyranids and Dark Eldar, but neither of which contained much in the way of uber-units. I was simply and determinedly drawing on my substantial collection of classic miniatures to fight my way out of a hole. This was on the whole a positive result from what started out as a bit of a concern (not winning enough games of toy soldiers? Talk about 1st world problems! ), but from this have come two further developments. The first was a distinct realisation that waaaay back when I was first playing games with my school friends, and doing very well, I had probably been what we would now term ‘that guy’. Winning was a big deal to me, and I was prepared to chase the newest powered up shiny unit to make sure that I did. Not only that, I was used to winning, which means I probably had an immature attitude to go with it, as I was still fairly young. I remember in particular two things from that very early gaming that with hindsight make me cringe. One was a game of 2nd Edition 40K in which I recall on turn 1 straight out of the gate, I unveiled a Polymorphined Imperial Assassin amongst a Farseer’s retinue, who then proceeded to Vortex Grenade an Eldar Dreadnought (as it was called at the time, later becoming the Wraithlord), and the Avatar of Khaine, who were deployed standing next to each other. Just like that, the heart of the enemy army was toast. The other memory, which I still have a printed reminder of, was our self-made Blood Bowl magazine, in which there is an article about an upcoming tournament final, and a comment that says ‘eight teams, one Frank, and no real chance of anyone else winning anything’. This still makes me cringe every time I read it. Thinking back, I am sure that this could not have been a positive or enjoyable experience for my friends, and I am ashamed to have taken so long to realise that. I would dearly love the opportunity to play those many games over with the attitude I hope I have now developed. Thankfully, this epiphany has resulted in my being more conscious of what kind of gamer I am and want to be, and how I conduct myself in games. I want to do well against players who are at least my equal if not my superior tactically, but I also want to avoid leaving players I am successful against with a bad taste, and a reduced desire to play against me in the future based on my conduct. After all, not much fun being a wargamer if you can’t find anyone that wants to play against you. The second thing I realised was that losing can be a very good thing. I have often found that I have enjoyed a close fought game that was decided with the last few rolls of the game more than I have enjoyed a game where I have stomped an opponent’s army into the mud, despite the rarity of that occurrence. Games are meant to be fun and exciting, for all participants. Feeling like we have given our all and on another day the outcome could have been different goes a long way to making us not only feel better about a defeat, but also drives us to want to play again. Everyone can enjoy a rematch! I found from my record keeping that it was an opportunity to keep notes on new units or tactics I had tried and how well they turned out, which enemy units were causing me the most bother and ideas for how to deal with them in future, and also which units had performed especially well and under what circumstances. This kind of information, along with the test of regularly being pitted against good players has been a much more effective way of improving my gaming skill than playing in a group where I am winning but not really being challenged. These days I would gladly offer advice if wanted after a game to an opponent I had been successful against in order to help them develop, and make them a tougher opponent to beat next time. It is true that if you want to get better at a game, you should try to play opponents who are more accomplished than you are, but the first step is in accepting both that there are always going to be better players than you, but also that you can improve your game. After all these years, and all the changes in my hobby habits and experiences, I feel like I have come to a place of enlightenment. I am enjoying slowly introducing my son to the hobby, playing a multitude of different games, and this alone makes me far less concerned with winning and losing to the point where the record keeping is now done more out of habit, if at all. I can play games at the club against any opponent, and I will always plan for it to be a positive experience, whether I win or lose, and I will not allow a stonking great defeat to sour my enjoyment of the hobby. No one can win every game. In the hectic world we live in, and with the busy lives we lead, the chance to get out and play games at all is the true victory. All stuff I agree with. When I got into 40K in 2006, I started recording my games. I’ve been doing it since and have 11 years of data to sift through. Always interesting to look back over the years and see the changes, for better or worse. I think the biggest thing to take away from record keeping is that it can be useful, and interesting, but if you let the result of every game become the focus, instead of the enjoyment of simply playing a game, it can become stressful without you even realising it, and then the hobby stops being the fun and fulfilling activity we want it to be. Have fun first, care about winning second. I absolutely agree. It took me a while to figure that out, especially during long periods of constant losses, but you’re right. I guess in a tournament you probably have someone else recording the results? Sure, but not my feelings with the game, what i did well and what wrong. You’re totally correct – these are useful things to record, and interesting to read back months and even years down the line. You should start, and let me know in a few months how it’s going, whether it’s been useful or changed your game or outlook at all. This is one of the best practices, even for those the play for fun. I keep a small mental record but recently have started jotting things down on the army sheet used in the game. I also keep a log of my army roosters as well. Howdy wargamers and hobbyists. I have been playing tabletop miniature games since the late 80's with HeroQuest and Space Crusade, before progressing to Space Marine (Epic), and I haven't looked back since. More of a narrative and casual gamer than highly competitive, I model, convert, paint, and play various games. Currently playing Warhammer 40K, Age of Sigmar, Kings of War, Frostgrave, Bolt Action, Warhammer Quest, Dropfleet Commander, Battlefleet Gothic, Necromunda, Man O' War & Blood Bowl! Ask me anything about my gaming and hobby experience, and I will tell you no lies.